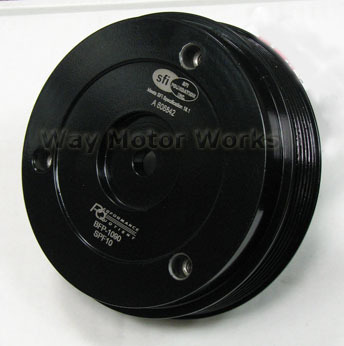 The R52, R53 MINI Cooper S crankshaft harmonic balancer pulleys are known to fail. Here is a better and more cost effective solution. PRW Fluid Dampers are made with an internal steel intertia ring that is surrounded by a high viscosity silicone gel. The internal intertia ring "floats" in the silicone gel to combat the engine harmonics at all RPM ranges. Crankshaft and bearing life is significantly improved and safely increases torque and horsepower. Includes threaded bore holes to mount a crank trigger on the face of the damper, thereby allowing ignition timing to be controlled and adjusted externally. Superior steel forgings and CNC machining ensure consistent finishes and tolerances. The fluid dampening design enhances smooth blower operation, and preserves main bearing life for engines that are tuned to perform far above factory specifications. These dampers are SFI certified to 12,500 RPM.